Well, the most powerful production revolver in the world anyway, and that’s just according to the manufacturer. 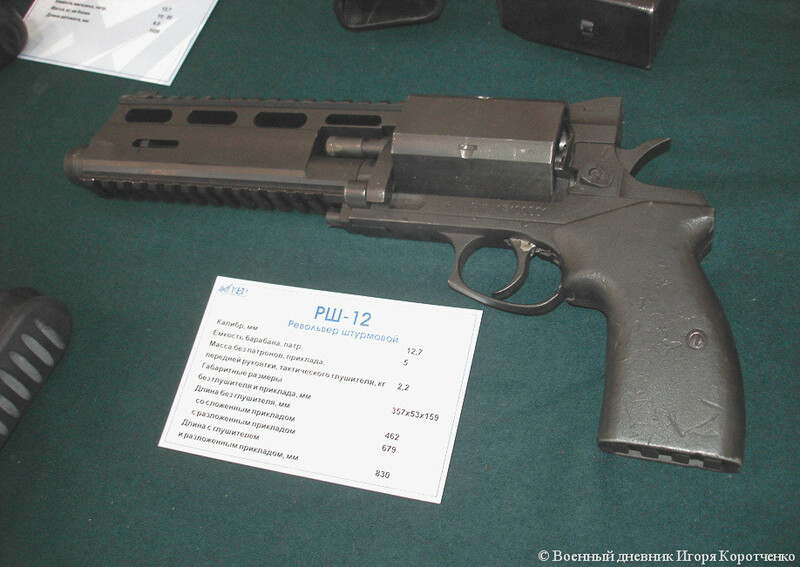 For whatever reason, Russian designers took to creating a revolver to fire their 12.7x55mm cartridge (speculated to be a cut-down .338 Lapua case; it and the rifle it was designed for have been covered previously on TFB here), it has been suggested for the purpose of destroying locks and other objects. One of the interesting aspects of the 12.7x55mm cartridge is that it is capable of being loaded with very, very light bullets for caliber; one aluminum-cored loading has been reported to be as light as 7 grams (108 grains). This gives the caliber the potential for very, very high velocity, and it’s possible that when firing this ammunition the RSh-12 could become the highest velocity production revolver in the world. The RSh-12 competes with the S&W 500 for the title of “most powerful revolver” in the world. It remains to be seen how powerful the former is, and whether it does take the crown from Smith & Wesson’s effort.